Frankenstein: The True Story (1973) [The Creature]: Buried (along with Leonard Whiting) in an avalanche in the arctic. Mascara (Make-Up for Murder) (1987) [Bert Sanders]: Commits suicide (while dressed in drag) by jumping off of a pier after talking to his sister (Charlotte Rampling). 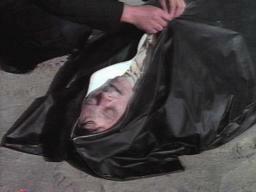 His body is shown being zipped up in a bodybag on the beach afterwards.